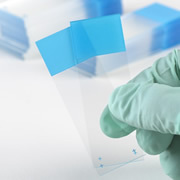 Diamond™ White Glass frosted microscope slides are produced using a unique chemical etching process. This provides the slides with a smooth frosted finish that won't wear out slide marking pens. Available with 90° or clipped corners and with single or double sided frosting. The slides are pre-cleaned and ready to use. 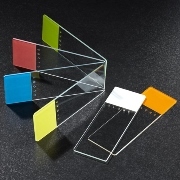 These plain microscope slides are produced from premium glass sheets and offer exceptional quality while providing considerable savings. Available in 3 styles: ground edge, ground edge with safety corners, and beveled edge with clipped corners. The slides are pre-cleaned and ready to use. These frosted microscope slides are produced using a unique chemical etching process. This provides the slides with a smooth frosted finish that won't wear out slide marking pens. Finding the perfect slide to suit your needs is easy: choose from one-sided or two-sided frosted, and ground or beveled edges. We also offer ground-edge slides with 90° corners (straight-edge) or safety corners. 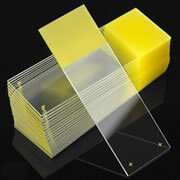 Color frosted microscope slides are offered in bright, attractive colors. They are available in three edge styles: ground, ground with safety corners, or beveled. 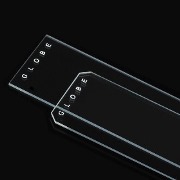 The ground edge microscope slide offers 90° corners and is perfect for use in automatic cover slip machines. 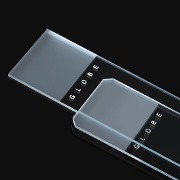 The ground edge microscope slidse with safety corners provide slightly clipped corners for comfortable handling and to prevent the risk of finger and hand cuts. 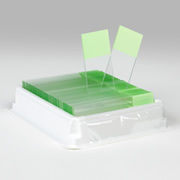 The beveled edge microscope slides are ideal for performing blood smears. The highly polished edges are specially angled at 45° to provide a secure grasp during the smearing process. Available with 90° ground edges, 90° ground edges with safety corners, or 45° beveled edges with clipped corners, and in a variety of colors. The slides are pre-cleaned and ready to use. Our cavity well microscope slides are ideal for holding liquids and cultures for microscopic examination. They are offered with 90° ground edges with slightly clipped corners for safety. Two styles are available: single or double cavity. The slides are pre-cleaned and ready to use. 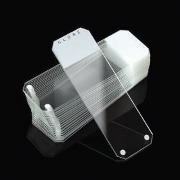 Produced from the finest quality white glass, these charged microscope slides provide the ideal surface for cell and tissue adhesion. They are ideal for use in histology, cytology and pathology departments, where the convenience of an adhesive slide saves the user time and money. Available with 90° ground edges or 45° beveled edges with safety corners, and in a variety of colors. The slides are pre-cleaned and ready to use.